Neroli may sound like an exotic oil from an undiscovered spice, but you’re actually probably familiar with the plant it comes from. This pure essential oil comes from the same trees that are famous for Florida’s orange juice. Neroli oil is produced from the bitter orange tree, which also gives us two other types of essential oils. Neroli essential oil is derived from the flower plant parts of the bitter orange tree known by the botanical name Citrus aurantium. The bitter orange tree is used to produce three different kinds of essential oils. The leaves are used to produce petitgrain oil, the rind of the orange fruit is used to make bitter orange oil, and the flowers are used for neroli oil. 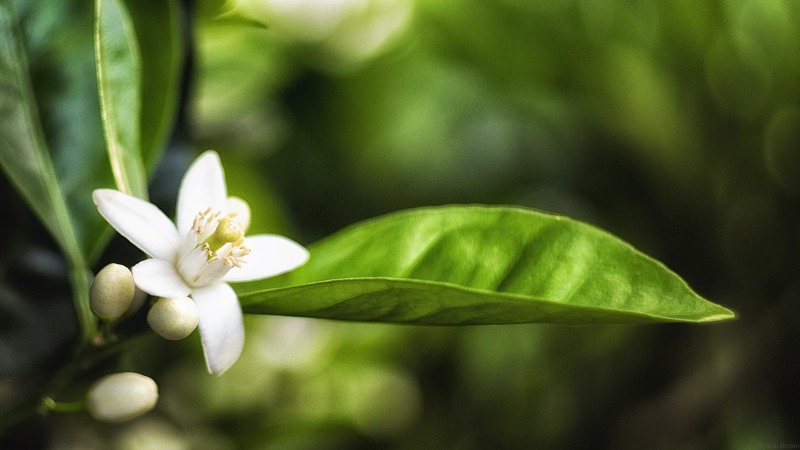 Neroli oil is derived through an extraction method of steam distillation where heat and water are used to draw out plant oils from the orange blossoms. The bitter orange tree is native to Asia—specifically India, the Himalayas—as well as eastern Africa. Today, the oil is largely cultivated in Morocco, Tunisia, Egypt, and France. The Spaniards also introduced the bitter orange tree to Florida in the 1500s. Since then, it has become a symbol of the state and features prominently on license plates and flags. Most of these oranges are used for orange juice and other products, although there are a few small producers of neroli oil in the state. Neroli oil is considered to be a feminine oil, largely due to its role in history. It's often associated with chastity, purity, and eternal love. Legends say that neroli oil was named after a 16th century princess who reigned in Nerola, Italy. This oil was also reportedly a favorite of Marie Antoinette. While it has feminine undertones, Napoleon also reportedly used the oil in copious amounts. Today, the fragrance is a key ingredient of eau de cologne and many women's perfumes. Neroli oil is renowned for a sweet and intensely floral smell. The floral aroma comes from its large concentration of neroli blossoms. It takes about 100 pounds of fresh blossoms to make just one single pound of neroli oil. It can be classified as both a citrus oil and floral oil. The aroma of this oil features a floral base with a delicate citrus finish. Neroli essential oil blends well with ylang ylang oil, rose oil, clary sage oil, and other citrus oils such as lemon and bergamot. Neroli oil offers sedative effects that may help soothe anxiety and improve sleep. The sweet, floral fragrance helps to reduce stress and may even manage menopausal symptoms. A study published in Evidence-Based Complementary and Alternative Medicine investigated the effects of neroli oil on stress and menopausal symptoms. The study consisted of 63 post-menopausal women who were divided into two groups. The women inhaled either neroli oil or an almond oil placebo for five minutes two times per day for a period of five days. The participants who inhaled neroli oil reported increased sexual desire and lower levels of cortisol—the human stress hormone. Those participants also reported higher levels of general well-being and happiness. A 2013 study examined the effects of neroli oil on anxiety and sleep quality of patients in intensive care units. The study consisted of 56 patients who were given aromatherapy or conventional nursing care. The patients that underwent aromatherapy were given a blend of neroli oil, lavender oil, and roman chamomile oil. The aromatherapy patients reported significantly lower levels of anxiety and higher quality of sleep when compared to the placebo group. Another study published in the Iranian Red Crescent Medical Journal focused on the effects of neroli oil in treating anxiety during the early stages of labor. The randomized clinical trial was comprised of 126 subjects in an experimental group and a placebo group. The experimental group was treated with aromatherapy while the placebo group didn’t experience any intervention during labor. The patients that had aromatherapy during labor demonstrated significantly lower levels of anxiety than the placebo group. Diffuse 3 to 4 drops of neroli essential oil in an ultrasonic or nebulizing diffuser when you feel stressed out. Set the diffuser to run for 30 to 60 minutes and focus on inhaling the floral fragrance. You can also dab 2 drops of the oil with 3 drops of carrier oil such as rosehip oil onto you hands. Rub your palms together, cup them beneath your nose and mouth and breathe deeply. Use neroli oil to increase relaxation or diminish the pain of menstrual cramps by adding it to a hot bath. Add 3 drops neroli oil to the hot water and soak for 15 to 20 minutes. Neroli oil contains high concentrations of vitamin C, which has been linked to firmer skin. Vitamin C is believed to increase collagen production, which helps to regenerate skin cells and tighten skin. Vitamin C helps to prevent premature aging by reducing dark spots caused by sun damage. Vitamin C also has anti-inflammatory properties that help to minimize fine lines and wrinkles caused by free radicals. Neroli oil may also be effective in treating wounds, scars, and stretch marks thanks to its chemical composition. A study published in the African Journal of Plant Science examined the effects of neroli oil on skincare. Researchers found that neroli oil helps decrease skin fragility, thus decreasing the development of new stretch marks. Researchers also found neroli oil has conditioning properties that may tighten and smooth skin. Combine two drops of neroli essential oil with 2 drops carrier oil such as marula oil to make a bedtime moisturizer. Apply liberally to face, being careful to avoid your eyes. The oil is gentle enough for use on all skin types, but make sure to always apply it using carrier oil. Dark circles are caused by weakened blood vessels that leak small amounts of blood into skin tissue. To reduce the appearance of dark spots under your eyes, use a combination of neroli oil and almond oil. Almond oil contains high amounts of vitamin K, which helps to strengthen blood vessels and minimize the appearance of broken capillaries. The neroli oil will work to tighten skin and firm up blood vessels to prevent further darkening. Neroli oil may help protect heart health by regulating blood pressure. A small study published in Evidence-based Complementary and Alternative Medicine investigated the impact of neroli oil on blood pressure. The participants consisted of 83 individuals who were prehypertensive or hypertensive. The participants were divided into three groups: an experimental group, a placebo group, and a control group. The experimental group was given a combination of neroli oil, marjoram oil, lavender oil, and ylang ylang oil. The placebo group inhaled an artificial fragrance and the control group received no treatment. The group that received essential oil aromatherapy demonstrated significant decreases in blood pressure levels compared to the placebo and control groups. The experimental group also had lower cortisol levels. Neroli oil helps to lower blood pressure by lowering stress and anxiety. Diffuse 3 to 4 drops of the oil at home or on-the-go whenever you feel stressed out. Use an ultrasonic or nebulizing diffuser at home or place 2 drops on a cotton ball or personal inhaler when you're on the move. Alternatively, unwind with a neroli oil massage. Combine 4 drops neroli oil with a tablespoon of carrier oil. Blend well and rub in gentle, but firm motions on sore muscles and tension spots. Make sure to inhale the aroma during the massage. Neroli oil boasts antimicrobial and antioxidant activities that help maintain overall health. One study published in the Journal of Oleo Science examined the efficacy of neroli oil against 13 bacterial strains and 8 fungal strains. Neroli oil exhibited moderate to strong antimicrobial activity against all tested bacteria and fungi. The main components responsible for these properties were limonene, alpha terpineol, and linalyl acetate. Diffuse neroli oil in your home to kill bacteria and fungus that can cause immune system diseases such as the common cold. Add 3 to 4 drops of the oil to a diffuser and run twice per day during cold and flu season or as needed for your health. There are no known side effects associated directly with neroli oil. There are always a few considerations and proper use guidelines that should be adhered to when using essential oils in general. Essential oils may cause skin irritation in certain individuals with skin conditions or allergies. Always apply essential oils in combination with carrier oil such as coconut oil or jojoba oil. Conduct a patch test of the oil on skin before applying in larger amounts. Keep the oils away from sensitive areas including your eyes, nose, and mouth. Neroli oil is “generally recognized as safe” by the Food and Drug Administration for human consumption. Don't take neroli oil orally unless you are under the supervision of a licensed aromatherapist or healthcare professional. Essential oils are highly concentrated and can cause negative side effects if ingested improperly or in large amounts. Some essential oils may cause interactions with medications. Neroli oil doesn't have any specific medical interactions, but should be used judiciously. Consult your healthcare provider before using neroli oil if you are taking and medications or have a diagnosed medical condition. Women who are pregnant or nursing should also consult a physician before using essential oils such as neroli oil. Neroli oil offers a potent floral fragrance that has been shown to increase relaxation by reducing stress hormones. This essential oil also offers conditioning properties that firm and tighten skin for a more youthful appearance. Neroli oil can also promote heart and immune health by lowering blood pressure and fending off invading bacteria. Diffuse the oil or apply it topically to reap these health benefits.